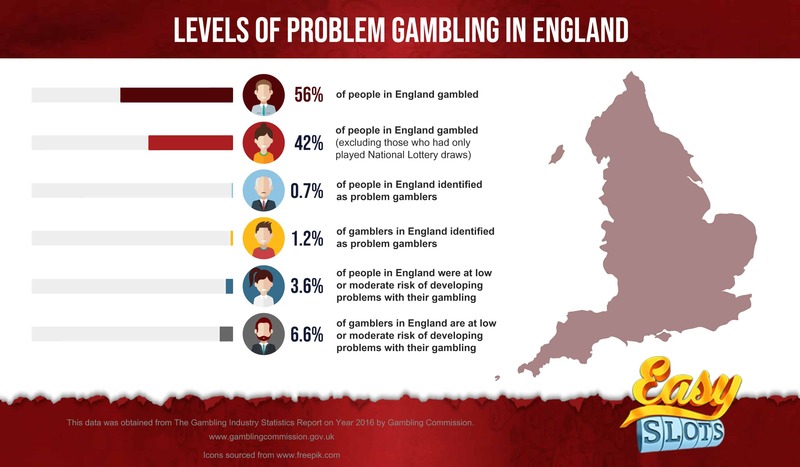 This is an Info Graph produced by Easy Slots to show and discuss the different levels of problem gambling within England and it’s potential effects. The data refers to statistics obtained during the Gambling Industry Report for the year 2016. Don’t forget you can check out more great information like this over at Easy Slots Website. A brief summary of the statistics shown in this Info Graph shows that 56% of people within England had gambled to some extent. With a total of 42% of the population having gambled excluding those who only played the national lottery. Furthermore, a total of 0.7% of the people in England would identify themselves as problem gamblers in comparison to 1.2% of gamblers would share the same identification. Additionally, if you are a gambler in England 6.6% of those have a low to moderate risk of developing problems with their gambling. In contrast to just 3.6% of people in England at the same risk.